A growing number of delinquencies and foreclosures on government-backed loans —combined with generous incentives for purchasing foreclosed homes owned by Fannie Mae, Freddie Mac and HUD — means buyers and investors will have plenty of opportunities in the coming months to pick up properties at bargain prices with low down payments and preferred financing. The two government sponsored enterprises (GSEs) — Fannie and Freddie — are acquiring real estate owned (REO) properties through foreclosure at a significantly faster pace than overall growth in REO activity based on RealtyTrac data from the second quarter. Fall is upon us in Macomb Michigan and you are trying to sell your house. Due to family reasons, job changes or economic reasons you are faced with a home to sell. How can you be successful and complete the sale in a decent time frame? The following is a list of 7 easy steps to get your home in Top-Block condition. 1. De-Clutter- I know that you are thinking "What should I do with all my stuff?" Well, the answer is simple. Get rid of it, give it away, or store it at a family or friends house. You are moving!! If it is in the next couple of weeks, or the next couple of months, start packing. Buyers want to see empty closets. Buyers do not care about your junk, they are sizing up your home to see if their junk will fit. Make 3 piles; keep, give away, or throw away. You will feel liberated to let it go!!! 2. Clean- You do not have to hire a professional house cleaner. Take one room at at time, and deep clean. Dust corners, vaccum under the bed and closets, use Fantasic on walls. Buyers love a clean home and will remember yours even if it is priced higher than the other homes in your neighborhood. Gather the family, turn on the radio and burn some calories. 3. Front Door- This is your first impression with the buyer, make it a great one!! Think of it as a first date. Paint or replace the front door if needed. Fix that torn screen, put a welcome door mat out, add some pots of flowers on your porch. Hang a wreath (could be seasonal). Polish the hardware on the door. Give them something to remember. 4. Kitchen- One of the most important rooms in a home. Is your kitchen in order? Do all the cabinets and door work properly? Women will open drawers and doors. Clean and de-clutter them. Even if you do not like to cook, this is one room that has to sparkle. Clean the sink and remove dirty dishes prior to showings. I know this is alot of work, but the competition is high, and you want to sell. 5. Bathrooms- Check this room before leaving the house. Did your children put the toilet seat down and flush. I know that this is common sense, but you would not believe how many houses I walk in and see this. Fix any broken shower doors, or replace that ripped curtain with an inexpensive new one. Scrub the tile, they will look. Replace light bulbs, give good light in the room. 6. Furniture Placement- Rooms need to look big. Again, you do not need to hire a professional home stagger. Ask your Realtor, they should suggest how to place your couch and chair in a room. You might not like it, but you are moving. A little change with placement could make all the difference in opening up a room. Maybe some pieces need to go into storage till the move. 7. Be Available- Let the home be shown. We are in a down market, with excess inventory available to buyers. Show the home, open the door, let them use the lock-box. Give a key to your Realtor if you do not want to have a lock-box. It might not be the most convienet time for a showing. You might have started cooking dinner, just got home from work, or even had plans for the day. Ask the showing desk to change the time 1-2 hours. Most Realtors are showing more than 1 house in your neighborhood at a time. They can adjust. Let the home be seen, the buyers will not come back, and you want to sell. I hope that your selling season is a short one, pain free. I hope that these simple steps will help you accomplish your goal. Your Realtor can advertise your home, do vitual tours, take pictures and write great listing remarks. You need to work with your Realtor and listen, they might not want to hurt your feelings and express all or any of the above. You are a team, and are working together to get you moving fast. Monday, Feb. 22 from 7:15 to 8:45 p.m. at the Washington Township Hall, located at 57900 Van *** Road. Property values have fallen so much in recent years that many homeowners who normally wouldn't bother to appeal their assessment actually stand a good chance of lowering their property taxes. These workshops are a great opportunity for homeowners to learn how to effectively appeal their assessment. Although we cannot guarantee your appeal will be successful, we will have experts on hand to assist you in the process. You may also download a free, easy-to-understand instructional guide that explains how homeowners may appeal their property tax assessment by visiting www.gophouse.com/lund.htm and clicking the "Publications" link on the left. For more information about the property tax workshop, please contact my office by calling toll free 1-888-MICH-REP (1-888-642-4737) or e-mail petelund@house.mi.gov. Looking for something to do this Labor Day Weekend? Looking for something that is cheap and fun for the whole family? Check out the Romeo Peach Festival in downtown Romeo, Michigan. The whole weekend has plenty to do, close to home, and is a blast. Small downtown Romeo will have carnival rides, a car show, and plenty of yummy peach pie. It is a great way to re-group with the family before school on Tuesday. Wear your walking shoes. Enjoy!! It is always a pleasure to report when a project is completed on time. It is a greater pleasure to report when that project is completed before the due date. Today the 26 Mile Bridge and Ramp has officially opened. It has been closed for months. The bridge was not to be finished before Labor Day weekend. My many thanks to the construction workers, planners and anyone that pushed this project to be finished ahead of schedule. The northern macomb county area relies on this bridge for easy flow from east to west. It has changed everyone's daily route who lives and works in this area. Thanks again!! This is surprising news for anyone wishing to sell or buy a home in Macomb County Michigan. 66 % of all homes sold within the first quarter were either foreclosed or bank owned. 12 % of all homes sold within the first quarter were recorded as leased properties. 22 % of all homes sold within the first quarter were private sales - and some were short sales. 1550 homes sold in Macomb County Michigan in the first quarter. • 1,458 sq. ft., 2 bath, 3 bdrm 1 1/2 story "Condo Attached" - MLS® $179,900 - Make Offer!! 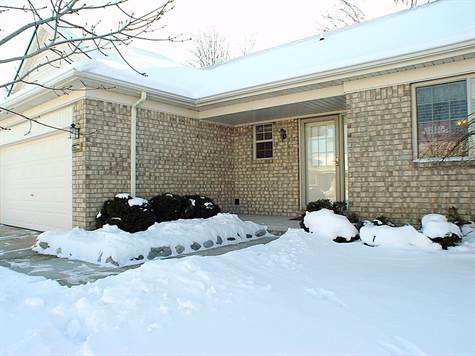 Westgrove Estates, Macomb Township - Immaculate & Gorgeous Macomb Condo Fantastic Location backs to wooded area. Beautiful lay-out with Great Rm. & Fireplace, Cathedral Ceiling, Doorwall leads to Brick Patio. Master suite with full bath & cathedral ceiling. Designer kitchen with all major appl. included. Large wrap island, stunning back splash with "tumbled" ceramic tile. Loft upstairs for library/office or 3rd Bedroom. Huge walk-in closets, 1st floor laundry with Mud area from deep 2 car finished garage. Full Basement prepped for bath-motivated seller,make offer.